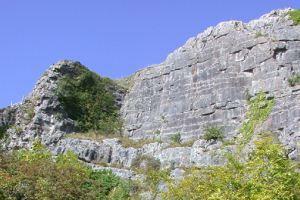 Llanymynech Rocks Nature Reserve Nature ReserveStraddling the border between England and Wales, the reserve lies at the southern end of the carboniferous limestone outcrop that stretches from Anglesey and the Great Orme at Llandudno. From the early 19th century until the end of the First World War, the site was a busy limestone quarry; since then peace has returned and nature has crept in to steal it back for herself. Llanymynech Rocks is spectacular at any time of the year, but Spring and Summer is the most colourful and full of life! Paths can be uneven, wet & muddy in places; sorry, the reserve is not accessible to wheelchair users. Well-behaved dog owners are welcome - remember, you dog doesn't know that it is a nature reserve, so please help us retain this privilege by keeping him on a lead and clearing up any mess.